So it's finally July, time to pack for DEFCON, follow @defconparties on Twitter and decide which villages to visit and which talks to attend. There's a new hacking competition this year called SOHOpelesslyBroken, presented by ISE and EFF. The objective on Track 0 is to demonstrate previously unidentified vulnerabilities in off-the-shelf consumer wireless routers. Track 1 will hold a live CTF for the duration of DEFCON. 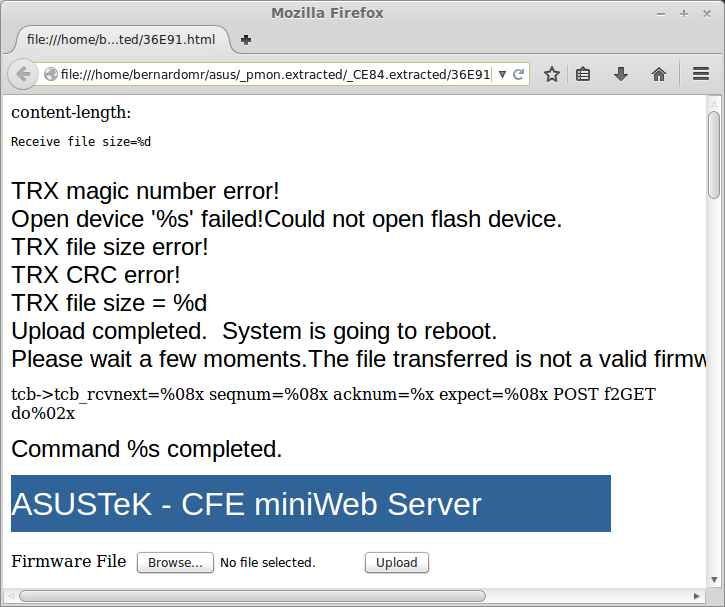 CTFs are always fun and this contest involves hacking real embedded devices, what makes it even more fun. I'm particularly interested on the EFF Open Wireless Router, but they didn't disclose details about the device yet. According to the event rules, the ASUS RT-AC66U (HW Ver. A2) [Version 3.0.0.4.266] is one of the possible targets. As I had a spare RT-AC66U at home, I decided to write a quick guide for everyone interested in participating in this competition CTF. The first thing to do is to find the firmware and its source code. 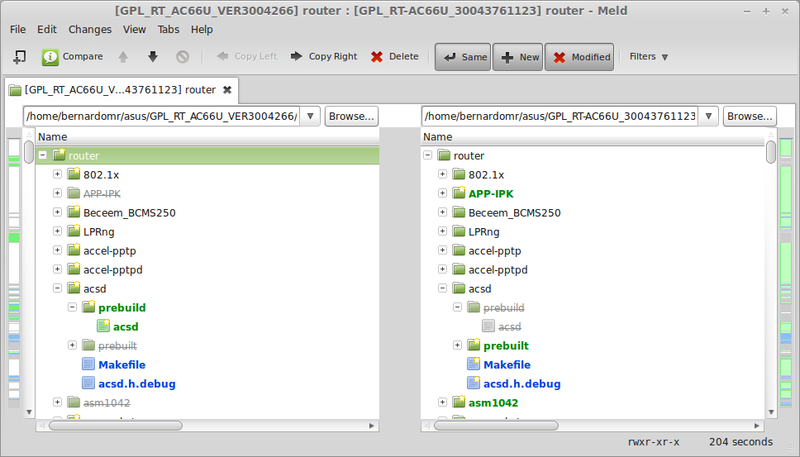 Hopefully, Asus RT-AC66U is GPL'ed and we can easily find its source online. The version used for the contest is an old one, from 2012. In order to perform a better analysis, we are going to grab the sources and the firmware from v3.0.0.4.266 and v3.0.0.4.376.1123 (the most recent one as of this writing). According to the rules, we have to identify and exploit a 0-day vulnerability. We can combine different flaws with known issues in order to score points. If the vendor had silently patched an issue and you create an exploit for it, that should be scored as a valid 0-day (I'm not going to start discussing terminologies here). Now that we have the source code, it's time to extract and audit it: The CTF Field Guide from Trail of Bits has some good resources on Auditing Source Code. You can use tools like Beyond Compare, Araxis Merge and WinMerge on Windows platforms or Meld if you're more of a Linux user. Points are deducted from your score if your exploits requires special system configurations and specific information. If you want to score lots of points, you should be targeting default services and processes. MiniDLNA is also a nice a target. It should be pretty easy to find vulns for the service using Zachary Cutlip's research, as he broke it multiple times. Another interesting partition is the bootloader (pmon). It has some LZMA compressed data and the boot process provides a failsafe mechanism to recover from a bad flash. Time to start the reversing tasks. 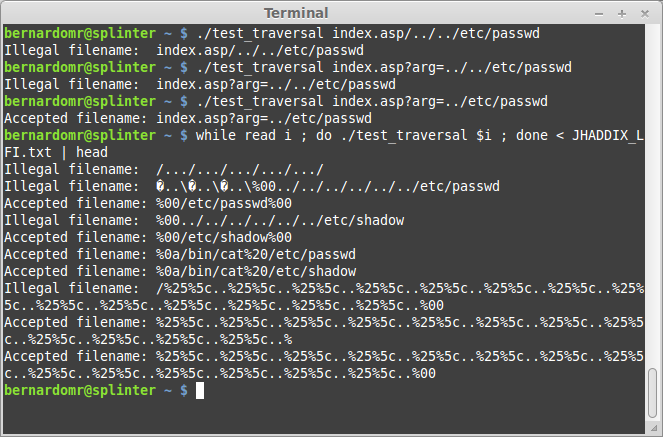 We need some basic tools like gdb, gdbserver and strace to start debugging the binaries: we could either cross compile them or set up Optware/Entware to install prebuilt packages. 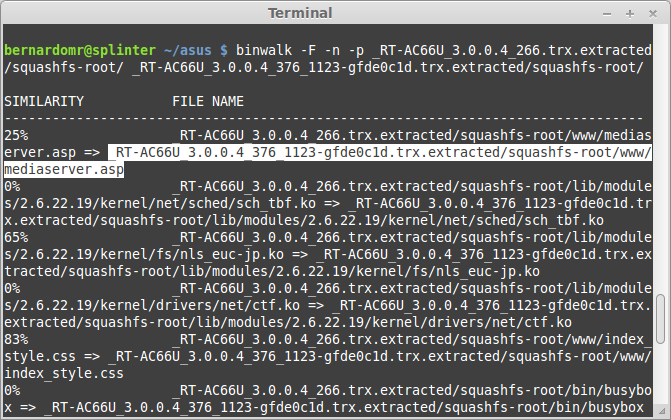 Wanduck (GPL_RT_AC66U_VER3004266/asuswrt/release/src/router/rc/wanduck.c) is an interesting process to analyze. It starts by default and binds a pseudo HTTP server on port 18017. The HTTP server redirects every request to the main administrative interface and, for some reason, it drops requests to URL's ending with ".ico". Let's find out why: start gdbserver on the remote target (gdbserver --multi localhost:12345 &) and connect to your debugger of choice. 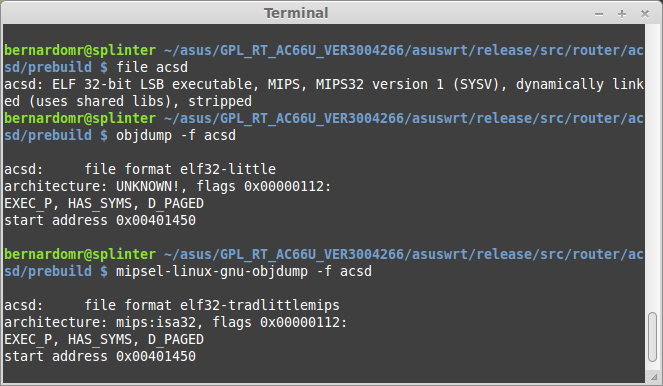 If you're using Ida Pro, open the binary "/sbin/wanduck" and set the processor type to "mipsrl". 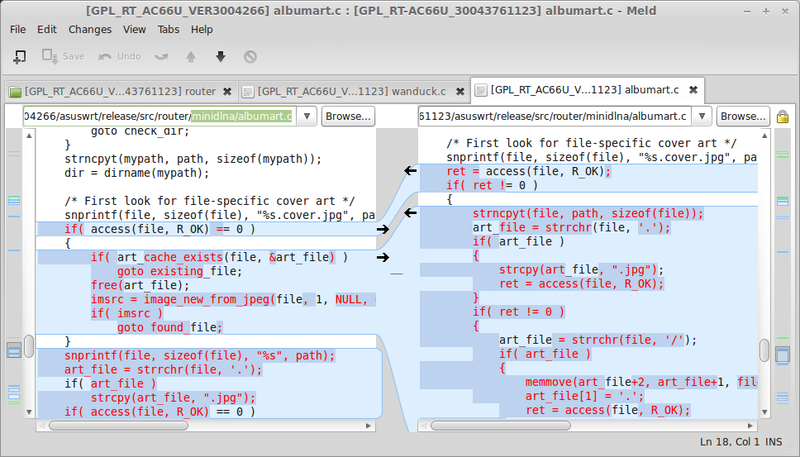 Enter the gdbserver's host and port under "Debugger / Process Options" and attach to the corresponding PID. Resume the process (F9) and make an HTTP request to http://192.168.1.1/x.ico. 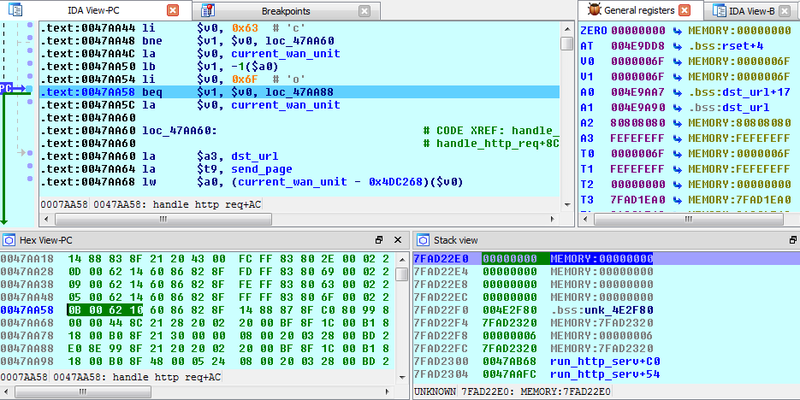 The debugger will stop at the defined breakpoint and you can now inspect the registers and the memory. 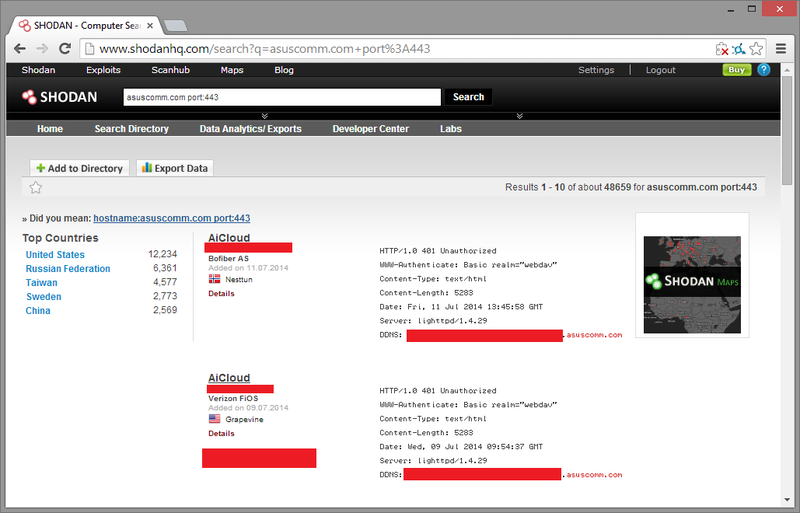 Using this information we can map the IP address for every single router using AiCloud. Let's generate a list of all the possible MAC addresses and brute force the hostnames using this cool trick from mubix. AiCloud runs on ports 8082 and 443 by default. The fact that anyone can easily map the routers running this service could be very worrisome, right? Another interesting crypto exercise is to reverse the algorithm used to generate the WPS device PIN. You can view the currently PIN and secret_code by issuing the following command: nvram show | grep -E "secret_code|wps_device_pin". Search for these variables in the source code and use this information to create you own WPS Keygen (don't forget to include a chiptune from pouet.net). There are so many things to test on the Web application that I'll focus on a few different approaches. The router's administrative interface has no CSRF protection. 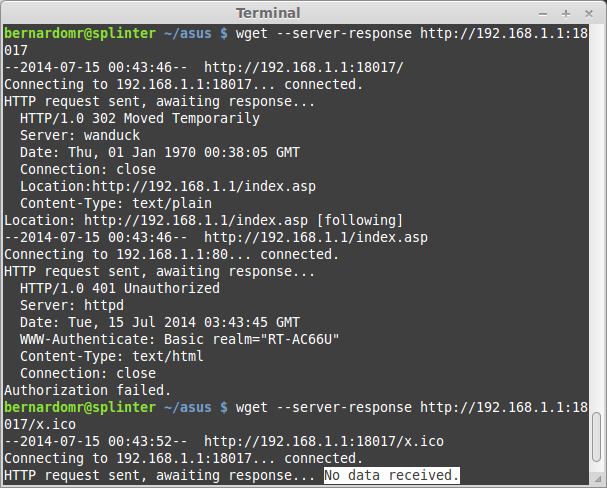 It has the traditional ping command injection and lots of XSS vectors. We can modify the nvram variables used to display this page and backdoor the router with a XSS payload, for example. 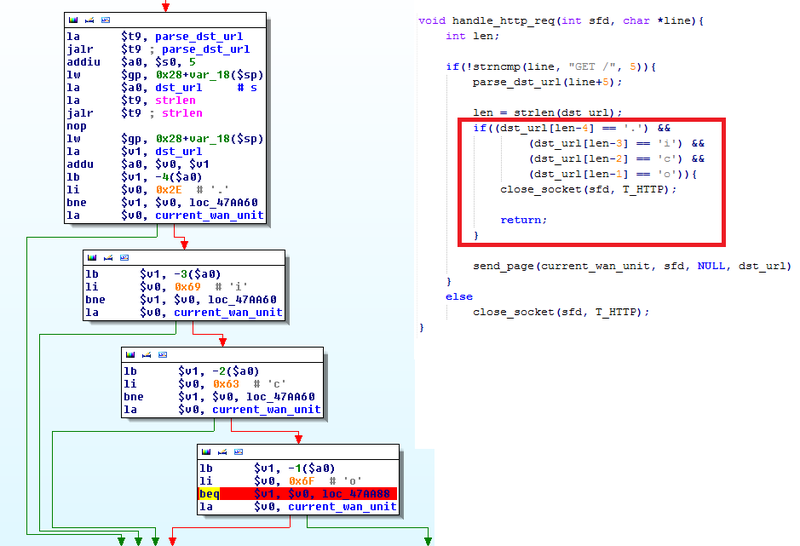 Some sensitive operations use the nvram_get and nvram_safe_get function. Some settings are stored using the nvram_set function. If the router does not sanitize the data being stored and retrieved from the NVRAM you may perform some kind of NVRAM Injection (remember, 00, %0A, %0D and `reboot` are always there for you). 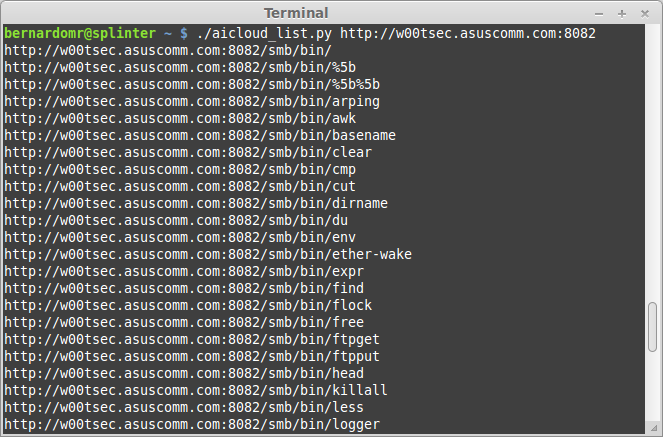 I wrote a simple AiCloud crawler that exploits this bug on RT-AC66U v3.0.0.4.266. 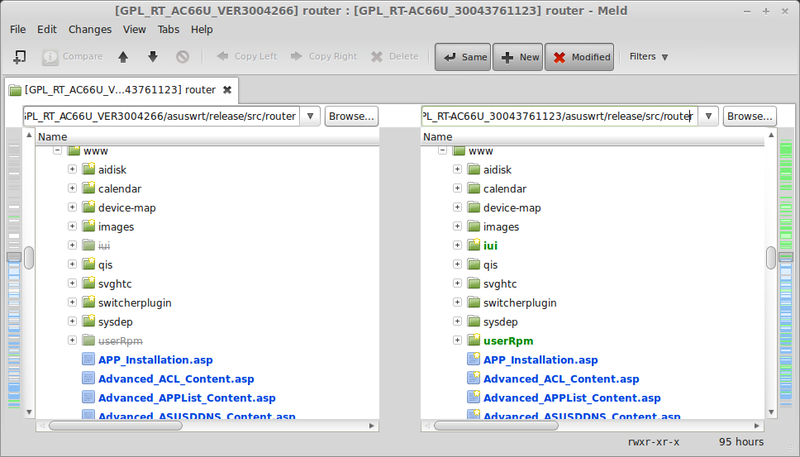 It lists all the files/paths from the router (including the attached USB devices). Last, but not least, don't forget to compare the differences between the files in the www directory. This path stores all the web components and scripts used by the web application. Why not trying to open the hardware case without voiding the warranty seal? You may need some tips from the guys at the DEFCON Tamber Evident Village. 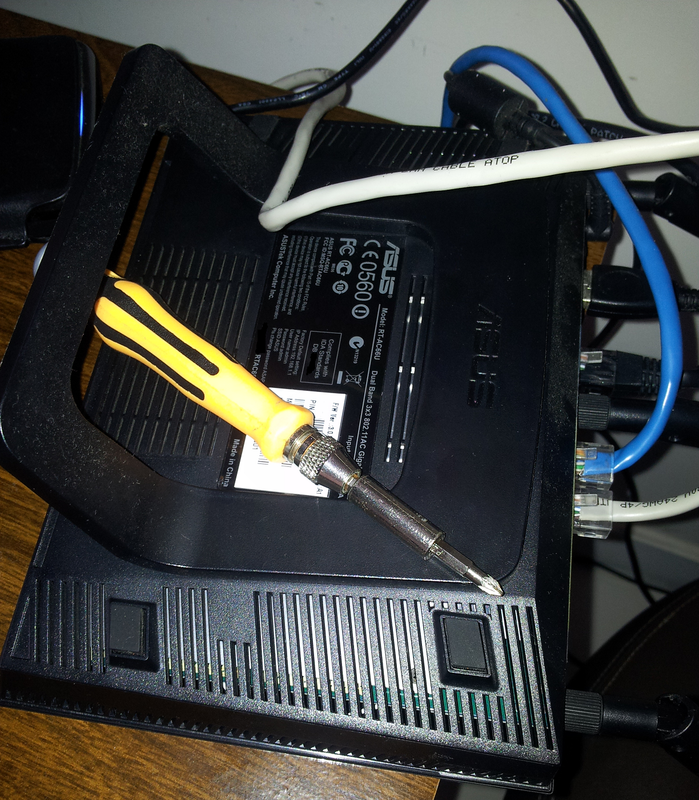 Hacking the Asus RT-AC66U is a very good exercise for the newcomers on router hacking. Most of its source code is available online and we can easily find lots of exploits and advisories for it. You may not have noticed but we tested every single aspect of the OWASP Internet of Things Top 10. Recent rumors indicate that this router is going to be used as the base for the OWASP IoT Webgoat and the Damn Vulnerable Embedded Linux. Nice post, and I love the bonuses they put in. Curious if you had seen these gems below yet? Shoot me a note at krlovett gmail, I'm actually rather curious if some of the most bizarre crap I found, very exploitable and not public, is stuff you found as well. SOHO is indeed very very broken. 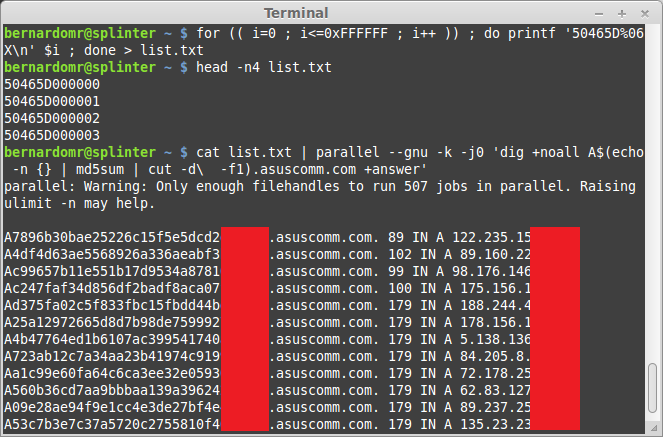 i want to ask u.
how to embedded ssh backdoor on the asus router undetecbel? sir the same has been done to me. please advice in the same for its reversal.and do a complete reset.your help can save my router.i tried restoring firmware but none helps. Can you tell me what eapd does?